Sunday school ministries should be designed to build spiritual maturity in church members and community residents. Sunday school ministries are important because they offer church members and community residents the opportunity to learn important lessons from the Bible and how they can apply those lessons in a practical and meaningful way. When running a Sunday school ministry, it's important that you get insight from your pastor and other church committee leaders so that your program best suits the needs of everyone in the congregation or those attending Sunday school from the community. Develop a biblically-accurate curriculum. Talk with your pastor and get suggestions on what types of lesson plans to purchase for the different age groups that will be represented in the Sunday school ministry. If your church is affiliated with a certain denomination, visit that denomination's website and click on sections such as "Education Resources for Teachers" or "Sunday School Resources." Then compare the materials' contents with what the Bible actually teaches on specific issues, including marriage, personal finance or childrearing. Seek out teachers for the classes. Interview them and ask them about their doctrinal beliefs, teaching philosophy and any ideas they would bring to the classrooms. Also explain to them the guidelines for teaching and what you expect from them as teachers. Use creative methods of learning. For example, set aside a Sunday out of each month where you can have each grade level in the program put on a skit that pertains to an important Bible lesson during the church service. Ask the third- and fourth-graders to perform a skit on the biblical doctrine of eternal salvation through Christ, and let the adult class do a skit about the roles of men and women in marriage. Why Do Students Give Apples to Teachers for a Gift? Theresa, Thea. "How to Run a Sunday School Ministry." 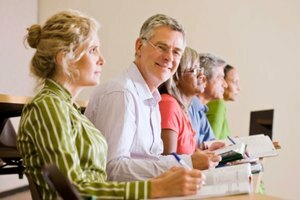 Synonym, https://classroom.synonym.com/how-to-run-a-sunday-school-ministry-12081665.html. 29 September 2017.